A great price and comfortable experience are weighed down by middling battery life and CPU performance in this barely ultrabook-grade design. We first crossed paths with the Lenovo IdeaPad U410 around this time last year, finding it to be a very tidy little package, even if it strained the Ultrabook name a little. Its mid-range price belied some rather useful specs, though, such as a dedicated graphics card and an uncommonly large hard drive. This year's Lenovo IdeaPad U410 Touch is basically the same, but better, for the same price - it's like the refreshes Apple does with its MacBook Pros and MacBook Airs, but this is actually more wide-reaching. The CPU is slightly faster, the dedicated Nvidia graphics are significantly more capable, the hard drive size is boosted from 750GB to 1TB (in an Ultrabook) and the RAM is up to 8GB. Oh, and the 14-inch screen is now 10-point multi-touch. Touchscreen laptops are more or less everywhere these days, from the Samsung Series 5 Ultra Touch to the HP Pavilion TouchSmart Sleekbook 15 - no matter the manufacturer, no matter the spec, if it runs Windows 8 it probably has a touchscreen. So while the name change from the original Lenovo U410 to the Lenovo U410 Touch here might draw attention to the touchscreen, it's not the special part: it's everything else in it that's noticeable. And this really carries through to the price: with a full recommended retail price of £749.99 / US$1,049 (around AU$1,225), you can already find the Lenovo IdeaPad U410 Touch discounted to around £600 / US$840 online, making the lower-specced and higher-priced Samsung Series 5 Ultra Touch look less appealing in comparison. That said, Lenovo has had to make compromises to get this balance of specs and price: this may still just about qualify as an Ultrabook, but it's thicker and heavier than most of its thin-and-light rivals. At 2kg (4.4lbs), it's a full third heavier than the Samsung mentioned earlier, and at 22.9mm (0.9 inches) thick, it's perhaps more 'quite-portable' than 'ultra-portable'. In terms of looks, it's pretty much identical to its predecessor, and similar to its little brother, the Lenovo U310, though less funky, perhaps. Our review unit had a black lid and bottom casing, with a grey keyboard housing. The build is about as sturdy as they come, for the most part. It's all plastic, though comparisons to Apple's MacBook range are inevitable when you're looking at it head on - the grey keyboard surround has a kind of faux-aluminium texture to it, and it has black keys and an all-black screen. 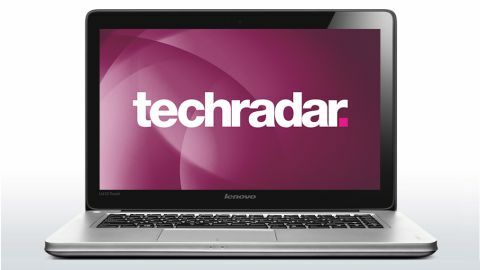 Though the design feels 'borrowed', it's been borrowed well - the Lenovo IdeaPad U410 Touch is smart, and wouldn't look out of place in an office or at home. In the fairly samey world of Ultrabooks, the Lenovo U410 Touch stands as a giant among men. Well, maybe not a giant, but certainly some sort of professional basketball player. In a mid-range price bracket dominated by integrated graphics and medium-sized hard drives, the Lenovo IdeaPad U410 Touch's specs are certainly worth raising an eyebrow or two over. The processor isn't anything particularly surprising. It's an Intel Core i5-3337U, which is an improvement over the 3317U in the original Lenovo U410. As you might guess, the new chip is a little bit better than the old chip, but it isn't massively different. Sadly, the new Core i5 processor isn't one of Intel's new Haswell generation chips; it's Ivy Bridge, the previous generation. Haswell offers drastically improved battery life over Ivy Bridge, but the U410 Touch has to make do without that. What you do get is a 1.8GHz clock speed, rising to a maximum 2.7GHz using Intel's Turbo Boost technology. It's a dual-core chip, which is no surprise, but it does feature Hyper-Threading, meaning that it can appear as four virtual cores (though this doesn't equal quad-core performance). As a newer chip, it's not something we've seen in loads of laptops just yet, though it did make it into the Dell XPS 18 portable all-in-one. Still, when you've got the similarly-priced Samsung Series 9 NP900X3D coming in with a much older and slower Intel processor, the Lenovo U410 Touch seems fairly well-stocked in the CPU department. This isn't a processor for high-intensity work, but it's more then enough for most people. The processor is backed up with 8GB of RAM, which is another small increase over the 6GB its predecessor came with. This again gives you plenty of headroom for performance in Windows 8. The tastiest part is surely the graphics card, though. The Nvidia GeForce GL710M packs 2GB of its own memory, and is a significant step up over the GL610 graphics card in last year's model. Though Intel's integrated graphics chips aren't too bad these days, there's no substitute for a real pixel-pusher, and that's what you've got here. It's not one of Nvidia's high-end chips, it's true, but it supports DirectX 11, PhysX and CUDA, so is equipped for some pretty serious gaming and graphics app use. The hard drive is similarly impressive, offering a whopping 1TB of storage. It's basically unheard of to get that much room in a laptop this size, and it's actually complemented by a 24GB SSD, which enables Windows to load faster from boot or wake. Not being entirely SSD-based means that it won't be quite as nippy around your files as Ultrabooks that do have solely SSD storage, but then, you tend to only get 128GB in those machines - not 1TB. The screen is a 1366 x 768, 14-inch affair. This is bog-standard as these things go, really - there are similar-sized laptops with lovely 1920 x 1080 screens, but they cost a lot more. That said, there are laptops in this price range with 1440 x 900 screens (such as the Samsung Series 9), but considering the better specs of the Lenovo U410 Touch compared to that machine, it seems like a fair trade-off for the price. As far as ports go, you've got a pretty healthy collection, consisting of two USB 2.0 ports, two USB 3.0 ports, HDMI video-out, a headphone socket, Ethernet and an SD/MMC card reader. As with most Ultrabooks, there's no optical drive, so you'll need to buy an external one if you want to load DVDs and CDs.